As one of the biggest public health threats today, climate change is a health equity issue. 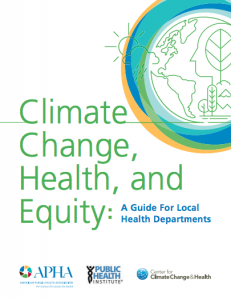 With support from the American Public Health Association, the Kresge Foundation, and the California Department of Public health, the Center for Climate Change and Health developed the Climate Change, Health, and Equity: A Guide for Local Health Departments, designed to help local public health departments integrate climate change and health equity into practice. Also check out the Physician’s Guide to Climate Change, Health and Equity and the Climate and Health Posters. View and download the full guide. Health Equity and Climate Change – It is hard to overstate the interconnections between climate change, health and equity. The Framework for Action in this section outlines these critical connections. Climate Change 101 – Climate scientists have supplied a wealth of evidence about what is happening to the earth’s climate and what it means for our local environments. Health Impacts of Climate Change – Predominant climate change impacts influencing health include extreme heat, drought, wildfires, air quality, allergens, sea level rise, storms and flooding and nutrition and food security. The Health Benefits of Climate Action – Action to address climate change has the potential for huge health benefits; conscious consideration of the health and equity impacts of various options for addressing climate change can help optimize the health benefits of climate action. Public Health Programs and Climate Change – This section identifies opportunities to integrate climate change and health into the following programs: Maternal, Child, Adolescent and Family Health; Clinical Services; Infectious Disease/Communicable Disease Control; Environmental Health; Chronic Disease and Injury Prevention and Control; and Public Health Emergency Preparedness. Public Health Functions and Climate Change – Local health departments are already engaged in surveillance and community health assessments, community engagement and intersectoral collaboration. The data, skills and practices used in these activities can be applied to integrate climate change into public health practice. Climate and Health Communications – Local health departments provide information to the public and policymakers about health risks and recommend strategies to promote health. Climate and health messages can be integrated into routine alerts, and into more targeted efforts to increase support for climate and health action. Conclusion – This section summarizes the guidebook and calls on public health professionals to take action on climate change and health equity now. Citations – View the citations of the guidebook grouped by section. Many local health departments across the country are already engaged in climate, health, and equity work in diverse and innovative ways, see the individual vignettes below for a snapshot of their work.